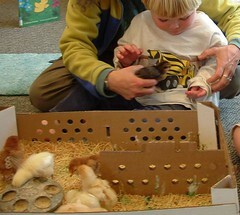 Each spring Amy brings her day-old chicks to her Storytime to show the children. It’s one of many seasonal programs she presents that introduce the children to some aspect of farm life in New England. Other annual programs are a visit to her maple sugaring house, stargazing, hawk watching, a maypole dance on May Day, and the famous haunted barn on Halloween.